Review: Adventure, sorcery, and mystery! The StudyTrain: Reunion of the Untouchables by Kurt Frenier is sure to capture readers' attention everywhere! Ethan is a lonely 17 year old boy who has no friends, lives in Switzerland, and his parents don't even know he's there. But when Ethan gets a letter asking him to come aboard the StudyTrain, his world changes forever. 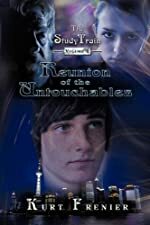 The StudyTrain: Reunion of the Untouchables is a fantasy novel and is the first in the The StudyTrain series. The StudyTrain is a magical school aboard a flying train that travels across the world teaching special children to become amazing leaders. Ethan is accepted to go to school aboard the StudyTrain for 8 years. Lord Althulos, the headmaster is very pleased with Ethan's academics aboard the train so he puts Ethan in charge of the delivery room. The delivery room is the place where all information on past students is located. But when Ethan discovers the untouchables, a group of past students that became evil, he starts to become evil. Ethan's dark fire makes him able to do sorcery like flying and able to control minds. But when the leader of the untouchables, Krixit, starts communicating with Ethan, terrible things start to happen. This book is amazing!!! I loved all the characters. They were all unique. I liked Lord Althulos the best. He's always making witty jokes throughout the book. Also, you get hooked right when Ethan steps on the train. I wish that Parker, Ethan's friend, wasn't evil. That's because I thought that Parker was going to help Ethan not become malicious. This novel is exciting and suspenseful. I couldn't put it down. I would rate this book 5 stars! This story is excellent for Harry Potter lovers! I can't wait for the sequel. We would like to thank Kurt Frenier for providing a copy of The Study Train: Reunion of the Untouchables for this review. Have you read The Study Train: Reunion of the Untouchables? How would you rate it?